It’s great to see he’s still getting good use out of an iPad 2, the 2011 generation of the iPad. 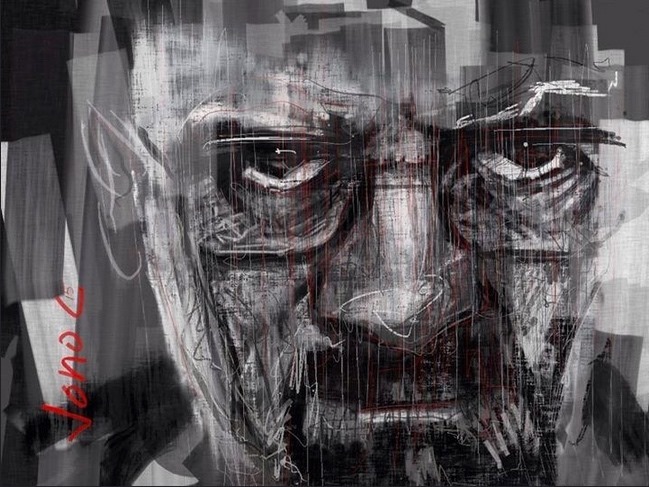 I love how this portrait brings out the scarier, darker side of Walter White. You can check out more of this artist’s work at his Jono Cappuccino Flickr stream. If you’re keen to see even more lovely iPad paintings from a number of great iPad artists, take a spin around our own iPad Art section. Somewhere out in the Milky way a signpost recalls another get away at the Outer or Twilight. If only to get away from the Corner of No and Where. A loving nod to Dance inspiration. This selection was made by my daughter, who just turned 12 this week. She is if anything an even bigger fan of Hotel Midnight’s work than I am. Can’t argue with the (sort of still) birthday girl, and also I think Between Dream and Believe is a pretty spot-on title for a 12 year old’s pick. If you want to become a huge fan of her work too, then check out the Hotel Midnight Flickr stream. To enjoy even more great iPad paintings, browse our own iPad Art section. 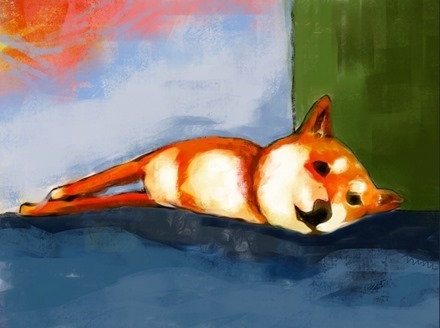 Our featured iPad painting this weekend is ‘Chill Zen’, created by nini_nini. I’m always a sucker for a painting of a handsome dog, and this one absolutely fits the bill. I love the colors of the dog’s fur and how well he or she evokes the Chill Zen feeling. It gives me a peaceful feeling to see such a content, relaxed doggie. You can see more of this artist’s excellent work at her nini_nini Flickr stream. And our own iPad Art section is full of wonderful iPad paintings from a number of great iPad artists. 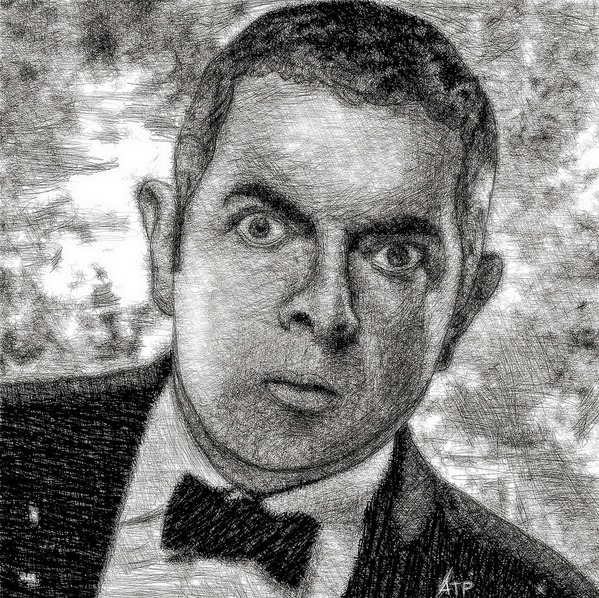 Our featured iPad painting today is titled ‘Johnny English’ – based on the secret agent spoof movie character played by Rowan Atkinson. This is the work of Álvaro Tajada Portalo, shared to our iPad Insight Flickr group. I think this paining captures that deer in the headlights look that Atkinson is so good at. You can see more of Álvaro Tajada Portalo’s work at his altapor Flickr stream. And of course you can find plenty more great iPad paintings from a number of excellent iPad artists in our own iPad Art section. 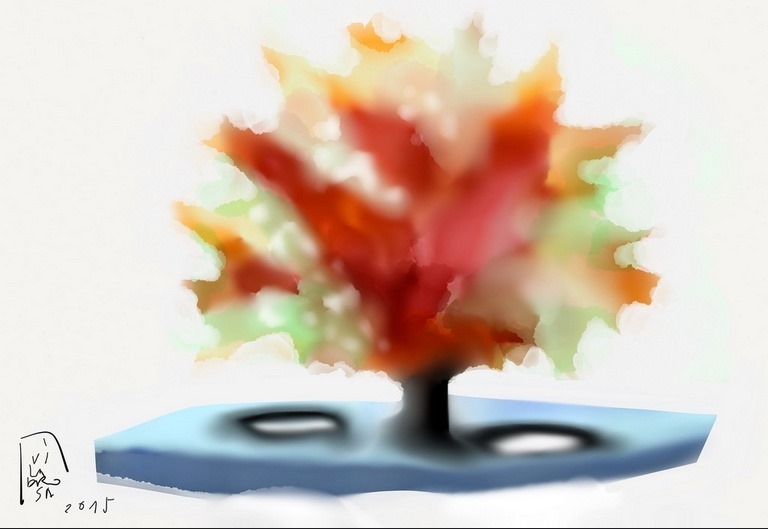 Today’s featured iPad painting is ‘Mis árboles’, My Trees in English. It is the work of Albert Viladrosa, done with the Paper by FiftyThree app on the iPad. I always enjoy Viladrosa’s light, abstract style and especially his colors. This one is just a lovely little tree. You can enjoy more of his iPad painting at the Albert Viladrosa Flickr Stream. 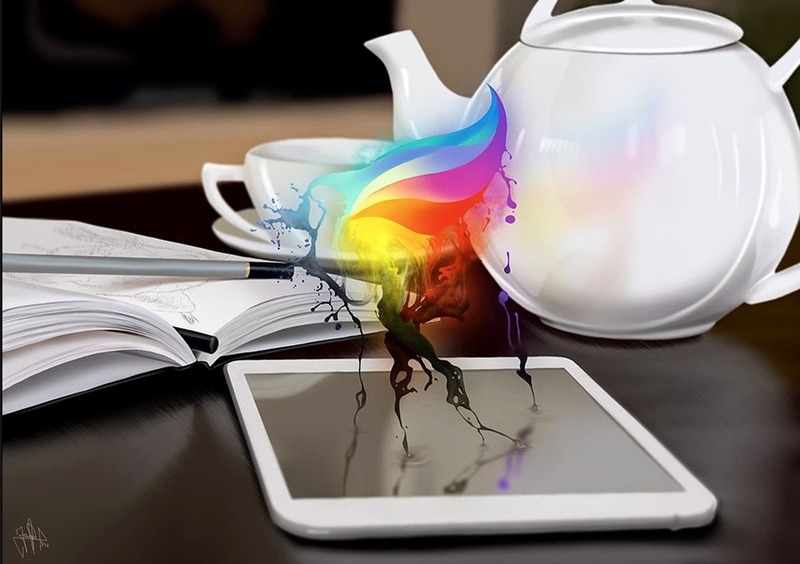 And of course you can browse through lots more incredible iPad artwork at our own iPad Art section. Today’s featured iPad painting has about as appropriate a title as you could hope for on Valentine’s Day weekend: ‘In Love’. This painting was done by one of my most favorite iPad artists, Pilar Humada – drawn freehand with the Sketch Club iPad app. 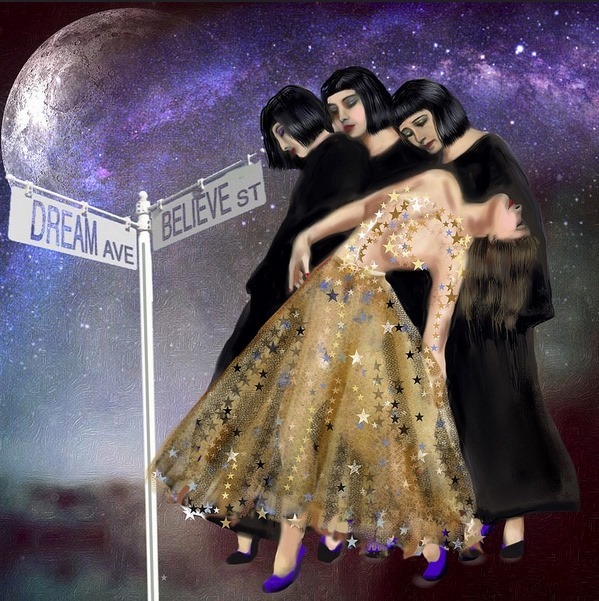 Please take some time to check out more of her beautiful iPad artwork at her Flickr stream. To see even more lovely iPad art from numerous great iPad artists, visit our iPad Art section. Today’s featured iPad painting is titled ‘Country Road’. It was painted by Ron Grafe, a member of our iPad Art community on Google+, using the Procreate app. 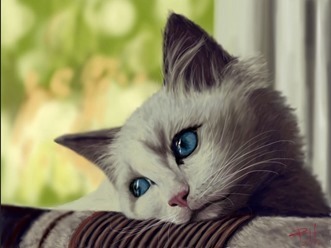 It’s a lovely and serene image for a Sunday afternoon. I really like the color of the road itself and the trees and sky around the first bend in the road. And lots more great iPad paintings can be found in our own iPad Art section. ‘Procreate’ is the title of today’s featured iPad painting. It’s the work of Jaime Sanjuán Ocabo, and I’m guessing from that title that it may just have been created using the Procreate app. I love to colors, reflections, and motion in this iPad painting. I also love that it’s a little spin on iPad painting within the painting. And of course if you’d like to enjoy more lovely iPad artwork, you can browse our own iPad Art section. Today’s featured iPad painting is titled ‘Fly Free’ and is the work of Deborah McMillion, aka Hotel Midnight – a long-time favorite here. Oh that first initial feeling of freedom as the cables snap and the carousel animals go free. Free as they fly but not when they land. Did you think they would run? SketchbookPro for iPad, distressedFx, alien sky, hair done with underlayer NASA shots from space “cyclone”. 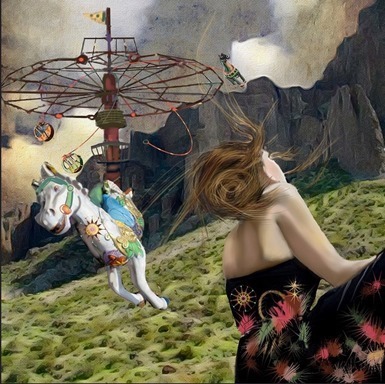 Fly Free is another great example of the two things that always stand out for me in McMillion’s work: the painting is striking and grabs my attention right away, and then her description takes you into the story that inspired it. You can see lots more of these striking paintings and their accompanying stories at McMillion’s Hotel Midnight Flickr stream. 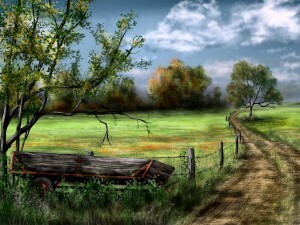 More beautiful iPad paintings from a number of great iPad artists can be browsed through in our own iPad Art section. This is the fourth painting in the series dedicated to endangered species. Now is the turn of the rhinoceros. It’s so sad to see news of any endangered species, but especially so when it’s about such an impressive, ancient looking creature like the Rhino. 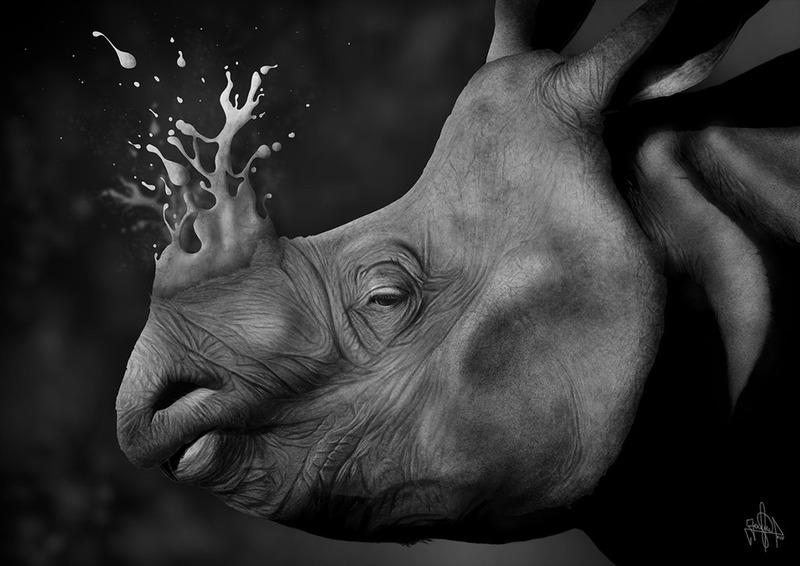 I like that this iPad painting brings out the best of the Rhino, while also implying the danger the species is in. To see more of this series and more of Jaime Sanjuan Ocabo’s excellent iPad artwork, check out his site. And to see more incredible iPad paintings from a large number of great artists, take a browse through our own iPad Art section. 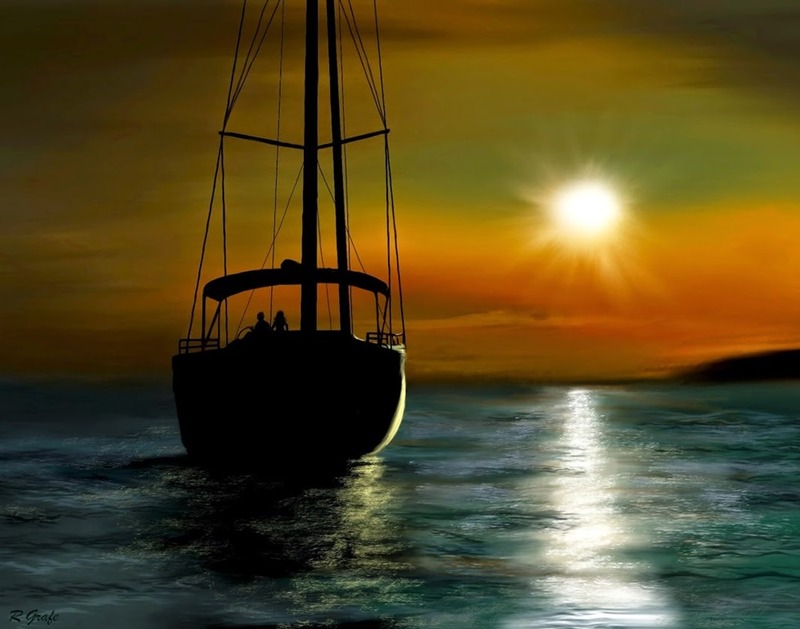 Who doesn’t at least once in their life like the idea of just sailing off into the sunset? I know I have at times and this iPad painting definitely brings back those feelings. I love the colors of the sky and the lines of the sailboat in this one. I’d like to be on that boat on that evening. If you’re keen to see more great paintings created on the iPad, then check out our own iPad Art section.